This is not a quote from or by Sinclair Lewis. The government cannot love you, and any politics that works on a different assumption is destined for no good. Fascism is dictatorship or supporting dictatorial form of government. History has seen enormous bloodshed and great agitations due to fascism. “Fascism is not defined by the number of its victims but the way it kills them” said Jean Paul Sartre. Fascism has clearly proved that oppression of the powerless is not a solution to all the problems and nothing can be achieved through power. 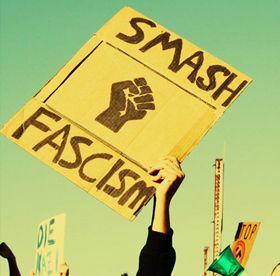 Fascism basically denies the power of speech and the freedom of expression. Since this is the basic right of humans and when such freedom is taken away, even if equality is achieved, it will not justify the means. Dictatorship is not the end of all paths leading to distribution of power. Fascism has been misused by the mighty, power- hungry leaders and hence has no significance in the democratic world of this century. Here are fascism quotes given by great and famous leaders.